We are an overhead line, underground utility contractor working on behalf of Dutton Utilities and Scottish Power energy networks. Distribution networks up to and including 132/275kV tower construction and stringing. Jointing capabilities Lv, 11kV up to and including 33kV. Cable laying Hv, lv Jointing. Lv, Domestic and commercial customers. In house Training SHEA Power, Manual Handling, Abrasive wheels. Pole top Rescue. EUSR, SHEA approved instructor. Our management team have over 80 years’ experience working in the utility industry in various distribution networks from SPEN, SSE, UKPN, WPD, NIE, (ESB ROI) with over 25 experienced linesmen with an array of skills and accreditations at our disposal, we also have cable jointing capabilities low voltage up to and including 33kV cables. 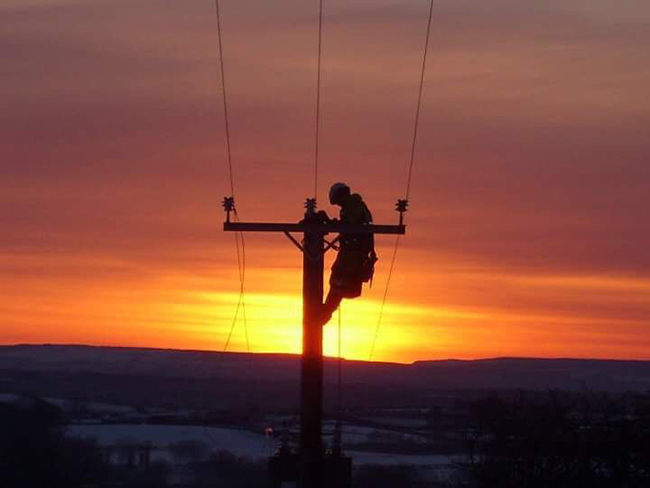 We are currently working for Dutton Utility contractors as well as Scottish Power Energy networks on pole refurbishment and replacement of the Lv and Hv systems. This also includes cable jointing and cable laying, domestic property services and commercial properties. We are able to mobilise our resource in times of storm force condition to assist other regional utility networks nationwide and further if required.